Malcolm was a fascinating failure. Adapting James Purdy’s marvelous novel (which in high school I used to swat away students pushing Little Jerry Salinger on me) seemed a perfect libretto for a musical. Too bad he didn’t team up with Sondheim. The Play About the Baby featured a naked David Burtka. But Albee is neither a pushover nor a simple man. After all, he breathed life into George and Martha, the married couple who battle ’til dawn in “Who’s Afraid of Virginia Woolf?” on stage and on screen (played by the real-life battling Burtons, Elizabeth Taylor and then-husband Richard Burton). In fact, George and Martha are still going at it, 50 years later, in a new staging on Broadway. Who could resist the chance to ask the playwright everything we want to know about one of America’s greatest plays? “Specifically with George and Martha, are those based on people that you knew?” Smith asked. At times, interviewing Albee can become a game of wits. “You don’t like to boil it down,” Smith said. “Any play that can be described in one sentence should be one sentence long,” he said. Albee controls all aspects of productions of his play, from selecting the actors, director, and even how his name and the play’s title are written on the marquee. It’s a way of protecting his work from the commercialism that he says is destroying Broadway. “It’s all about not doing the best plays but doing the ones that will sell the most tickets [which are] usually junk,” Albee said. “Very seldom. I used to go see more since I’m one of the voters for [the Tonys]. Now I just lie,” he laughed. Albee’s written some 30 plays in all, and won his first Tony Award for “Virginia Woolf” back in 1963. It is by far his most famous, and early on, it was a bit infamous, too. “Going back to ’62, a lot of people who were involved in the production of ‘Virginia Woolf’ were nervous about the subject matter, about the language. Were you nervous?” Smith asked. “Well, I think if you don’t offend some people, you’re probably failing in some way,” he laughed. “The Pulitzer jury chose ‘Virginia Woolf’ for the Pulitzer . . . ” Smith said. What happend was he “scandal” manufactured by homophobes who decided that George and Martha weren’t genuine heterosexuals but (clutch those pearlslike there’s no tomorrow) GAY MEN IN DISGUISE! It was all part of an evil plot men with “strange twilight urges” were inflicting on unsuspecting heteroseuxal Americans . Stanley Kaufamn, then The World’s Worst Newspaper’s drama critic raised quite a ruckus about this which “CBS Sunday Morning” declines to mention. Albee went on to win three Pulitzer Prizes for drama, for “A Delicate Balance” in 1967, “Seascape” in 1975, and “Three Tall Women” in 1994. 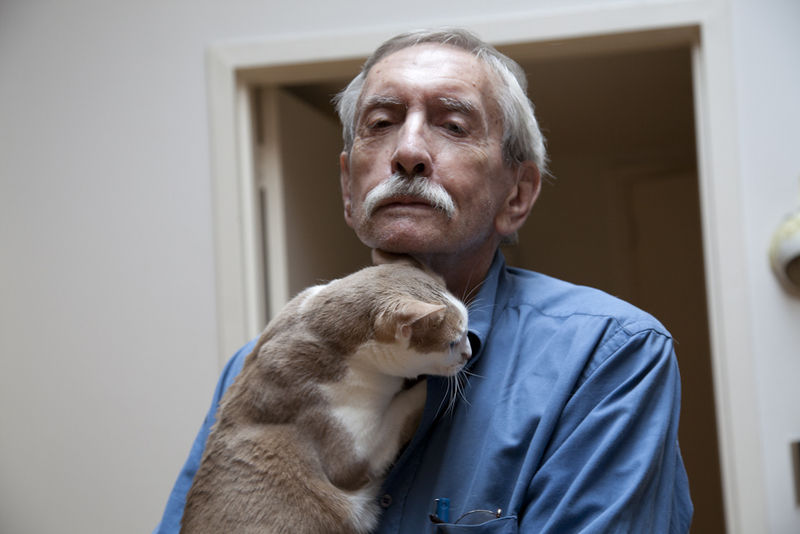 Edward Albee was adopted as a baby in Washington, D.C., by Reid and Frances Albee. The Albees were heirs to a vaudeville theater chain. Young Edward grew up rich . . . financially, at least. “I didn’t like them very much and I don’t think they approved of me very much, either,” he said. “But they were stuck with me and I was stuck with them, you know, until I was 18. But they gave me a first-rate private school education. I’m enormously grateful that I was adopted and given all the comforts that one could possibly have. I just don’t think we were the right people for each other,” he said. It was 1948. Albee came to Greenwich Village, New York, a place where he could thrive as an artist and as a person who’s openly gay. “Why would I keep it a secret? It’s my nature,” he said. “Well, so that’s why you might want to hide it,” Smith suggested. His relationship with his parents was another one he struggled to understand. “Did you try to reconcile?” Smith asked. “Not with my adoptive father. He died before I could. And my mother, adoptive mother, started growing old and so I was a dutiful son. But I don’t think we ever really related to each other,” he said. “It seems that she was quite proud of you,” Smith said. “She was quite proud of Edward Albee,” he replied. While Albee didn’t find parental love, he did find romantic love with sculptor Jonathan Thomas, who died of cancer in 2005. “I think you’ve said the love of your life,” Smith said. Edward Albee says it’s his plays that are important, not him. But as the world continues its appreciation — not only of his writing but of how his plays are performed — you can’t help but realize how important Edward Albee, the man, remains. I for one certainly prefer a live Edward Albee.